Opening a business is increasingly becoming a challenge for African immigrants hoping to cash in on opportunities in the U.S markets. It is not all gloomy as some immigrants are trying to create their own niche markets. Lasanna Tambajang in his early 50s took a $10,000 loan in the Gambia in the early 1990s to pursue a better life in the U.S. His experience in small and medium scale business back in Africa paved the way for him to open a fish and meat business in the Bronx. Founded in 1998, the Fish and Meat market along Boston Road in the Bronx is largely run by his family. It now has two outlets in the Bronx and has three mobile trucks that distribute fish and meat to customers in Queens and Brooklyn. Overall, the business earns an estimated $3 million a year. “It is not easy for immigrants to set up business in the U.S, my father experienced several challenges in getting customers and making some profit, sometimes people hardly give you a chance if they don’t know you,” Lamin Tambajang pointed out. The Fish and Meat market’s immigrant identity runs throughout. The family business has a dozen employees mainly immigrants from Latin America, Asia and Africa. “I was employed here because back in Mexico I have skills in processing fish and meat, I must say I enjoy working here because of the mixture of immigrants from different parts of the world,” said Jesus Mario Santos. It’s selection of goods also cater to immigrant communities. “I like buying stuff that I can identify myself with, when I visit this store I buy food stuff that I don’t usually see in well-established food stores in Manhattan,”’ said Musa Kane, a regular customer at the Fish and Meat market, who is also an immigrant from Mali in West Africa. Kane says he enjoys cooking smoked fish and snails during his quality time on weekends. 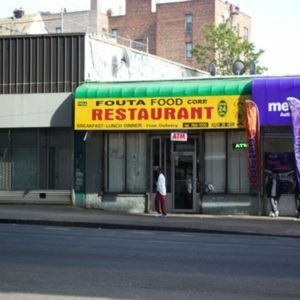 Momodou Jallow, another immigrant from Guinea in West Africa set up the Fouta African restaurant in Westchester Avenue in the Bronx with some immigrants from Spain and Mexico who are now American citizens. “We realized in the past that so many immigrants were getting homesick because there were no restaurants selling typical African and Spanish food” said Momodou Jallow. According to the U.S Black Chamber of Commerce, African-American businesses have grown at an exponential rate in the 21st century. It states that there are nearly 2.6 million African-American owned businesses in the U.S as of 2018. The U.S Black Chamber of Commerce research revealed that the gap in average wealth between African-American and white adults decreases from a multiplier of 13 to 3 when one compares the wealth of business owners by race. At Gun Hill Road and Pelham Parkway in the Bronx, there are a number of African-American small and medium scale business that have sprung up recently. Some of the business are beauticians and grocery stores that specifically target the huge black community in the neighborhood. “My parents originally come from Nigeria in West Africa, they winded up their clothing business in Nigeria to look for better opportunities in the U.S.,” said Jimmy Asoayabo, a beautician who employs more than twenty-five people at his shop on Gun Hill Road. Inspired by the American dream, African immigrants are leaving the continent in large numbers to the U.S in the hope of getting better opportunities to rebuild their lifestyles. African immigrants and immigrants from mainly Muslim nations are increasingly finding it difficult to come to the U.S due to what many call President Trump’s harsh immigration policies. Lamin Tambajang said the company is trying to expand new source markets in other major U.S cities like Pennsylvania, Seattle and California but it has been difficult. “You know it’s not easy nowadays with the heightened tensions on immigration, getting the right personnel to work is difficult to come by,” he said.